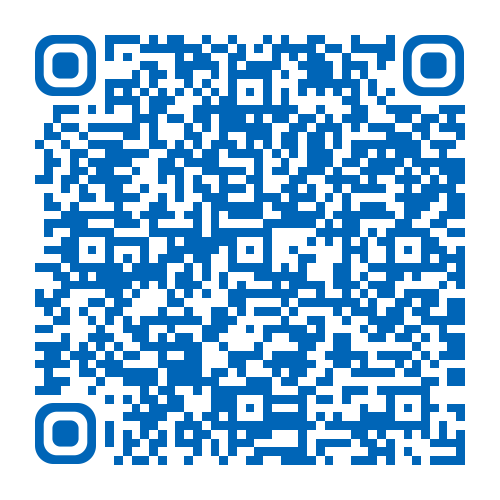 This leaflet has been produced to give you general information, following removal of your cast. Most of your questions should be answered by this leaflet. It is not intended to replace the discussion between you and your doctor, but may act as a starting point for discussion. If after reading it you have any concerns or require further explanation, please discuss this with a member of the healthcare team caring for you. Following removal of your cast you are likely to notice that your skin is very dry. To improve this it is advised that you place you lower leg in warm water for 5 – 10 minutes. Once removed from the water the dry skin should then rub off easily with a towel, do not be tempted to rub too vigorously as you may damage the skin. As soon as your lower leg is dry apply moisturising cream to the affected area. Repeat this process daily until your skin returns to normal. Now that your cast has been removed, it is common to experience aching in the foot and ankle. You may feel some stiffness and, in cold weather, often may notice it looks a little blue in colour. Swelling may occur for several months particularly in the ankle therefore you must elevate your leg, when resting, above the level of your heart. Exercising your ankle will also help reduce swelling. 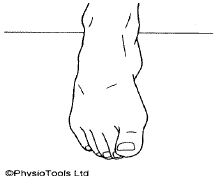 If your ankle was swollen at the time your cast was removed you may have been given a tubigrip support to wear. The tubigrip will normally be applied in a double layer, which has its fold near your toes and finishes around your calf. 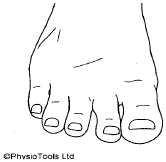 Remove the tubigrip if your toes become blue, more swollen, numb or if you have pins and needles. It is important that you exercise your ankle as soon as you can after your cast has been removed. 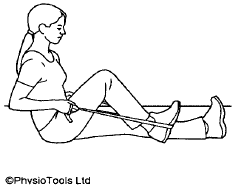 By exercising and regaining normal movement the feeling of stiffness and pain will gradually reduce. 1. While sitting, lift your foot a few centimetres off the floor and pull your toes and ankle up towards you. To assist this movement, place a scarf or towel around your foot and pull your foot up by pulling the scarf with your hands. Hold this stretch for 10 seconds. Now point your toes away from you. Hold the stretch for 10 seconds. 2. Remain in the same position and gently turn your ankle inwards then outwards. Ensure the movement comes from your ankle and not the knee. Hold the movement in each direction for 10 seconds. 3. Moving only from your ankle joint make a circle with your foot. Then repeat in the other direction. 4. 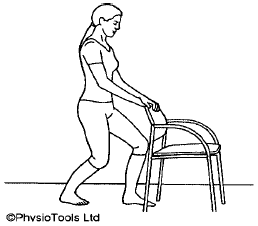 Holding a chair, step backwards with your injured leg. Keep this leg straight, with your toes pointing forward and the heel on the floor. Now bend your other knee until you feel a gentle stretch in the calf of your injured leg. Hold this for 30 seconds. 5. 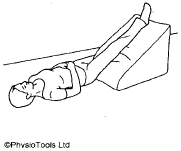 From the position above move your injured leg forward but keep it slightly behind your other leg. Ensure that your toes point forward and bend both knees, keeping the heel of your injured leg on the floor. You should feel a gentle stretch in the calf of your injured leg. Hold for 30 seconds. 1. Find a friction free surface, for example a wooden floor or a tea tray placed on your bed, so that your foot can slide easily. Sit down and stretch your legs straight out in front of you. 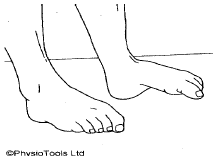 Rest your foot on the friction free surface and slide your foot up towards your bottom by bending your knee. You may want to wrap a scarf around your heel so that you can assist by pulling either end of the scarf with your hand to bend your knee further. 2. Curl your toes as far as possible. Hold for a few seconds and then stretch them up the opposite way. Now try to spread your toes as wide as possible. The hospital staff will tell you how much weight you can put through your leg and provide you with a walking aid if necessary. Try to walk as normally as possible even if you are using a walking aid. When stepping forward, your heel should touch the ground first, followed by the outer border of your foot, then onto all of your toes. Unless you decline or have almost full range of movement immediately after the cast has been removed you will be referred to physiotherapy out-patients to continue your rehabilitation. At this appointment you will be assessed further. Initially you will be asked a series of questions which are all designed to help your physiotherapist plan the best course of treatment for you. You will then be examined; therefore it is advisable that you wear shorts or loose clothing so this can be done properly. Following your assessment the physiotherapist, with your consent, will choose from a range of treatment techniques depending on your progress. 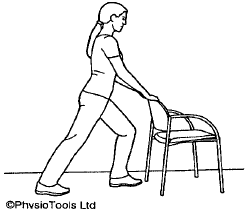 In addition the physiotherapist will ensure you have exercises to practice at home. These exercises are vitally important to ensure you give yourself the best chance of a full recovery. The aim of rehabilitation will be to get you back to normal life as quickly as possible. However, as every individual’s injury, lifestyle and recovery varies; it can be hard to give definite timescales for this. You should discuss this with your physiotherapist. If you have an urgent query regarding your symptoms, following the removal of your cast, please telephone the fracture clinic. If however the query is related to physiotherapy please telephone the physiotherapy team.